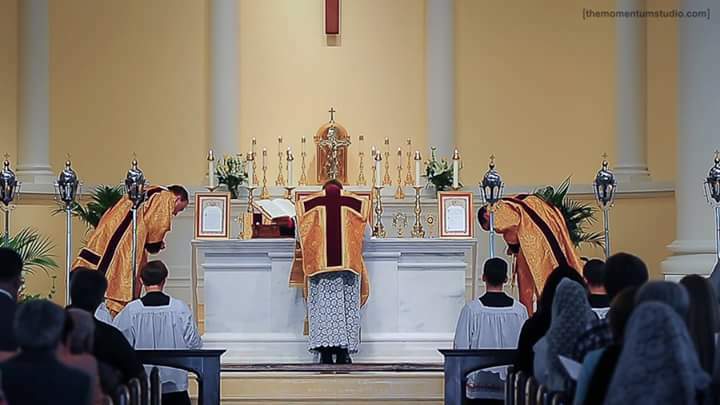 For many today, the Traditional Latin Mass is fulfilling just such a need. Rediscovering the manner in which the Church has worshipped for centuries has helped a growing number of Catholics to encounter the Lord more deeply. What many are realizing is just how effectively, and beautifully, the traditional Masses engages our senses. Indeed, it is the Mass for all senses. The Latin Mass presents a visual which immediately speaks to the true focus of our adoration and worship. As the priest offers the Mass ad orientem (facing the altar or the liturgical east) we immediately recognize that the liturgy is not about us. This is something that simply must be experienced by the faithful to fully appreciate. In the past I have called this a true “game changer”, and it is. There is a significant liturgical catechesis in the simple fact that the priest is facing with the congregation, instead of facing the congregation. Far too many Catholics have experienced anthropocentric masses over the years, liturgies in which priest and faithful seem to focus their gaze upon each other. Malcolm Cardinal Ranjith, the former Secretary for the Congregation for Divine Worship, said that often in the modern liturgy the priest has become a “showman”. As the priest spends much of the Traditional Mass facing the same direction as the faithful, speaking Latin the entire time, there is little confusion as to who he is speaking to. The use of a liturgical language is another manner in which the traditional Mass effectively engages our senses. Maintaining an aura of mystery and antiquity, the liturgical use of Latin immediately transports the faithful from the secular into the sacred. The familiarity and comfort of the vernacular is left behind as we enter into the Holy Mass. However, it is also the absence of sound that catches our attention. This becomes most obvious during that most venerable of prayers, the Canon of the Mass. Dating back at least to the sixth century and Pope St. Gregory the Great, the Roman Canon (called Eucharistic Prayer 1 in the New Mass) is spoken nearly inaudibly by the priest. The great nineteenth century Benedictine liturgist Dom Prosper Guéranger describes this silence by stating that the priest “then enters within the cloud” with his voice not being heard again until the “Great Prayer is concluded”. This silence is only interrupted at the moment of consecration by the ringing of sanctus bells, signifying Our Lord’s presence on the Altar. Many newcomers to the Latin Mass are struck by this absence of sound. Our culture puts a premium on noise. Silence, intentional silence, can be quite jarring at first. However, over time, the faithful learn once again how to use this silence to pray the Mass, instead of simply going to Mass. Finally, if one is so blessed as to hear a High Mass, they will be treated to some of the most beautiful music ever created. A few years back Archbishop Alexander Sample noted that not all religious music is sacred music, but rather that which possesses three qualities: sanctity, beauty and universality. While seventies Haugen and Haas music, or nineties Praise and Worship songs, might be about God, we can objectively say that they are not sacred music. Liturgical music, true sacred music, is Gregorian chant and polyphony. The liturgical movement of the twentieth century sought to recover this musical heritage of the Church. From canonized popes (St. Pius X) to ecumenical councils (Vatican II), Holy Mother Church has consistently reaffirmed that this music is most appropriate for the Mass. The use of incense within the Mass communicates to our olfactory receptors that we have entered into the sacred as this is not a scent identified with the hum drum of daily life. We find incense referenced all the way back in sacred scripture by St. John in the Apocalypse as he describes his vision of the heavenly worship, where an Angel holds a golden censer near the altar, upon which stands the lamb. The Church incorporates the use of incense during the Mass to symbolize the smoke of purification and sanctification. Incense is also understood to represent the prayers of the faithful rising to heaven. Our sense of touch is most fully realized through the frequent posture of kneeling within the ancient rite. Simply put, we kneel more at the old Mass. During a Low Mass the faithful kneel from the prayers at the foot of the altar in the beginning all the way until the reading of the Gospel. During the Creed we also kneel when professing that Christ was incarnated and born of the Virgin Mary. Most notably, the faithful kneel to receive Holy Communion. The final of the five senses is taste. The reception of Holy Communion, kneeling and on the tongue, fosters a true sense of awareness in the faithful. We are more clearly able to perceive what it is (or more accurately Who it is) we cannot touch. In the Traditional Mass only the consecrated hands of the priest touches Holy Communion. This was the universal practice of the Church for over a thousand years and, now more than ever, speaks to the sacredness of the moment. The children of Holy Mother Church are spiritually nourished by the Bread of Life. This most sublime moment of Holy Communion concludes our walk through the Mass of all senses. Understanding and appreciating that we are indeed both body and spirit, the Traditional Mass engages each of our five senses, thereby drawing us even deeper into the Eucharistic mystery. In the field of education many readily accept that people learn through a variety of senses: some are more visual, some auditory, others more tactile. Stepping outside of the more contentious liturgical skirmishes of recent decades, let us extend that same understanding of communication to the Sacred Liturgy. It is my hope that more faithful Catholics would seek out and avail themselves to the traditional Mass. May the Mass of the Saints lift our spirits toward heaven through the engagement of our senses. This article originally appeared as a guest post written for the Catholic Gentleman.